Extra Humidification: Supports 12h long-time humidifying at full 300 sq.ftvolume (Other 300ml aromatherapy diffuser only supports 10h) for all-night humidification without waterless worry.Built-in auto shut-off protection when water used up. 150ml Measuring Cup Included. Ideal Diffuser for Aromatherapy: Adopts ultrasonic technology that provides whisper smooth mist and pleasant aromas to create a soothing, relaxing ambiance soften and moisten dry and chapped skin. Perfect for aromatherapy, yoga, meditation and more. Natural Style: Natural wood-grain design makes it perfectly match the decor or furniture in your bedroom/office/workbench and more. Made of superior PC material, non-irritation, non-toxic. Brightness Adjustable 7-Color LEDs: Built-in 7-color LEDs and 2 lighting modes(Color Changing/Continuous Lighting). In Continuous lighting mode, each color can be adjusted from bright to dim with one single LIGHT button. Time Setting: 4 Time setting modes(1H/3H/6H/Continuous Mist). Safe for overnight use or while you're on-the-go, our automatic shut-off prevents the diffuser from burning out. Just turn on the MOSPRO essential oil diffuser and enjoy your personal aromatherapy, yoga or spa! 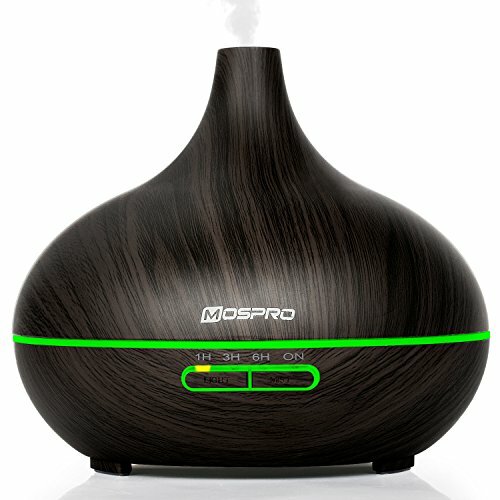 Why choose MOSPRO essential oil diffuser? Safe for overnight use or while you're on-the-go, our automatic shut-off prevents the diffuser from burning out. 7-Colour soothing LED lights, cycling through it or fixing one color. Dim/Brighter brightness selectable. 4 Time setting modes-1h/3h/6h/Continuous Mist for you to choose. 12-Month satisfaction warranty for after-sale customer service. 1.Please add water below the max water line. 2.Please don't press MIST when there is no water in the diffuser. All diffusers sold by us are covered with a 12-month satisfaction warranty. If you're not satisfied with our product. Please contact with us. And we will make things right for you.